I didn’t find nearly as much time to read during my vacation as I had anticipated. Shuffling between six cities and three countries pretty much eliminated any of the down time we normally experience while traveling. Jet lag kept me from waking up early…and put me to bed involuntarily. I still managed to finish two books in between museums, palaces and cafes. The Back Door Man was one of them. Once you start reading Dave Buschi’s first entry into the techno-thriller genre, you’ll quickly realize why I finished this one. It grabs hold and doesn’t let you shake loose…not that you’d try. This was a very addicting read from start to finish. Take a look at my review of this incredible find from a promising author. As a side note, I’m a little more than half way through his second book, Proportionate Response. I lost a lot of time over the weekend sneaking away to read a few pages at a time on my Kindle. “Meet James Kolinsky, a mid level, low profile information security manager at ComTek, a market leader in providing information security to banks and large scale commercial companies. The future is uncertain at ComTek, as James and the rest of the company’s employees head home at the end of the day. Many of them don’t expect a job to be waiting for them in the morning, including James. When James’s credit card is rejected while trying to pay for gas on the way home, he returns to ComTek to retrieve some petty cash in his desk. He shouldn’t be in the building after hours. Neither should the company’s COO. ComTek’s emphasis on security extended well past the firewalls and systems provided to their customers. Come to think of it, security never carried firearms before. Something had changed at ComTek, and the last thing James suspected was that it all revolved around him. 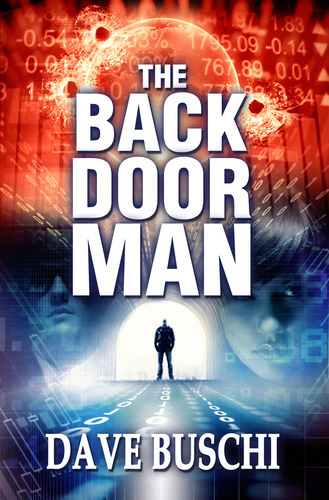 David Buschi’s techno thriller, The Back Door Man, starts strong and never lets up. From the very first page, I was hooked. Think of the mayhem that caused by the sudden “wipe-out” of every major bank account worldwide, of every credit card and personal financial instrument. Then think deeper. Through James Kolinsky, Buschi brilliantly and patiently describes the high tech aspects that underlie this possibility…then he takes us out into the physical world, where the consequences aren’t limited to the invisible exchange of bytes along high speed communication wire. This is a world where the impact of such a catastrophic event threatens the very safety of family and friends. The conspiracy goes deep in The Back Door Man and unleashes some of the most unsavory characters you have ever met in a thriller novel. Ruthless executives, brutal power brokers and apologetically sadistic organized crime syndicates. David Buschi takes terrifying to new levels as he weaves these characters into the story and pits them against James Kolinsky. This was my favorite aspect of the story. When we meet James, he’s not much of a man…or maybe he simply resembles the average middle aged cubicle prisoner in corporate America. Either way, he was specifically targeted for a reason. They were convinced he’d roll over…that he was an easy target. I won’t spoil too much of the fun, but I had a blast watching James defy these expectations against overwhelming odds. It kept getting better and better. One last note for this review. Buschi presented a lot of technical details about the information security world. I was transported back to Clancy’s older works, where I would get pleasantly lost in the details. Unlike Clancy, Buschi throws the reader a lifeline during these descriptions, keeping them manageable for non-techies like myself. I can honestly say that Buschi’s treatment and description of The Vault, a key setting in the story, is alone worth reading the book. Sounds like another book to add to my kindle! I finally found time to read another author…between Russell’s books. I should really blame Dave for delaying Blake’s review. Another great discovery, but he’s not as prolific. Who is? Steve, your review is better written than my book. I’ve decided I’m going to have you ghost write my next book. Don’t tell anyone. Check out the comments under my recent review of Russell’s book. He is offering a ghost writing service. Pretty hilarious. I just sent him a check to write my next one. He captured all of my ideas in one paragraph. By the way, what’s with you taking my best material? Ghost write. I thought I thought of that first, and then you have to ruin my day by telling me you wrote the same thing before me. And then Russell has to go being a showoff with his paragraph. I’m going to go pump some iron, drink some milk and then come back and kick both your behinds. The book is quite good (I read it in a day) and should appeal to both tech and non-tech folks. What struck me about Kolinsky’s dilemma in the book was how entirely plausible (and possible) the whole scenario of a rogue trojan virus is. Good reading.